Today we taught in S-1 and S-2 classes for Bible. There are many new students in these classes, and we were so thankful to be able to teach them! We taught from Romans 3, 5, and 6, trying to present a clear plan of salvation. We discovered that words that we easily understand have different meanings to them. For example, demonstrate meant a rebellion to the law. When in the context that we were teaching, it means shows or proves! WOW! What a confusing thing for them! But that is what we need to understand in order to teach them correctly. They are so eager to learn, so attentive and respectful. Having visiting Americans teach is exciting for the students! 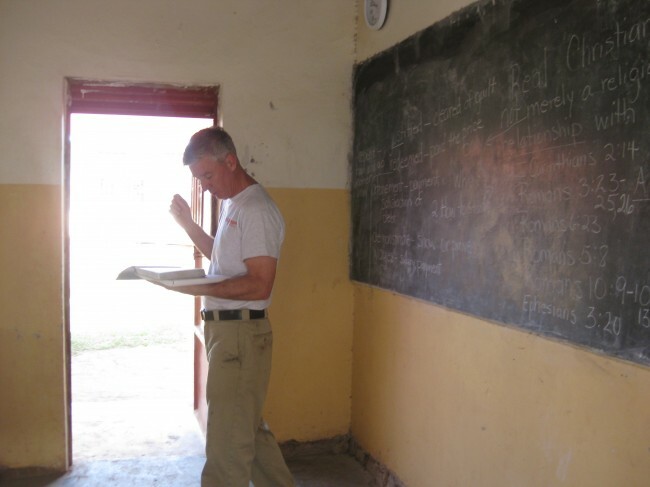 Glen leads a Bible class, while Marie teaches music. The footings are complete, and the walls are going up on the kitchen. The African people are hard workers. Moses is the head brick mason. You will remember that he is the man that Glen baptized in July! We made another long trip to Kampala for shopping and for once Grammy is tired of shopping! Miracle! We are building good relationships with the new staff at Agape. Eve is the headmistress, Stella is the administrative assistant, and Winifred is the Matron. They are so wonderful and a great asset to the school. Please continue to pray for health. Annet is better, but is finishing her malaria treatment. Eve is also taking malaria treatment. Zion has been really sick and on IV treatment for malaria. 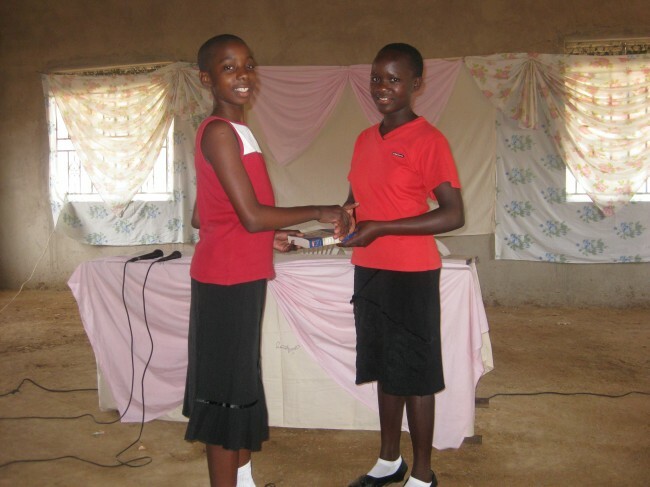 During a church service held at Agape, Lillian (right) gives one of the new students a Bible. 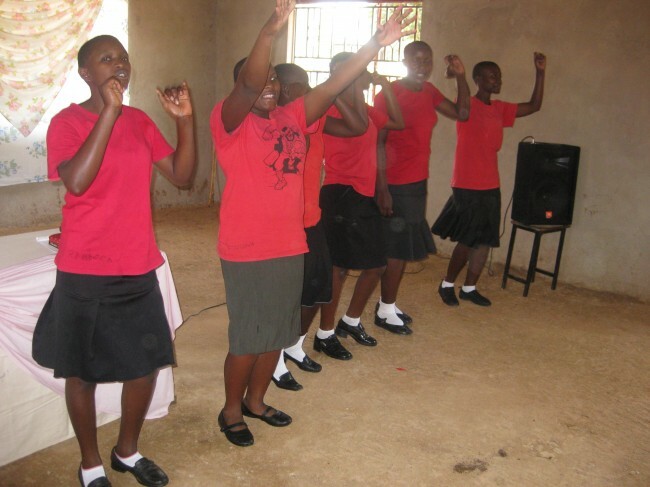 Church services at Agape include worship in English and Lugandan. The children of Agape actively participate by leading songs and sharing Scripture. Today was spent teaching three Bible classes in the morning on salvation and discipleship. It was challenging in some ways as we saw how difficult the English language can be when one word can have so many different meanings! However, it went very well, and we are encouraged that they are understanding much more. 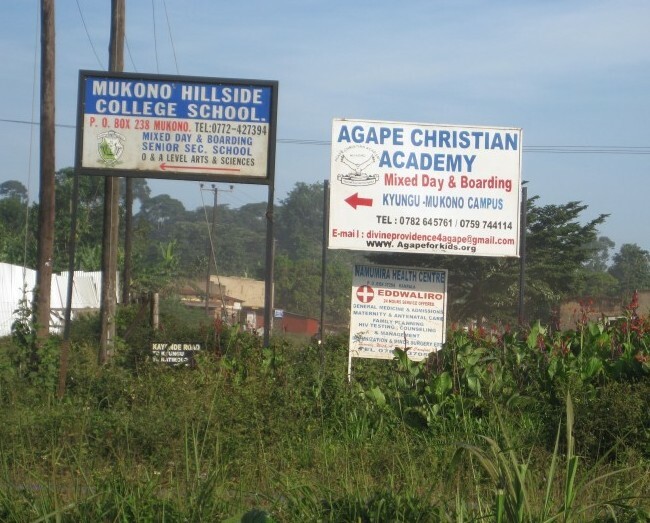 New billboards advertize Agape Christian Academy for boarding and day students! This afternoon was music class for me (Marie) for 2 hours! I discovered that there are MANY ways to teach music, and I am so excited to be able to share my knowledge of how I learned. They do NOT use staff and notes here, so the music teacher is excited to be in my class also! I am excited to learn his method. Glen is doing an excellent job. A natural!! !